I was physically sick at E3 this year. No, I hadn’t had too much alcohol, too many showfloor hotdogs or a single drop of radioactive energy drink with 5000% of your recommended daily intake of vitamin B. All I did was don an Oculus Rift and put my head in World Rally Championship 6 for approximately 45 seconds. That was all it took. VR sickness doesn’t creep up slowly. It’s fast and unrelenting. One second you’re fine, taking in the instantly impressive 360 view of a living, roaring rally track, the next, there’s a thin layer of sweat covering your entire body and there’s an immediate desire to yank off the headset just to make it all stop. That’s not even mentioning your stomach, churning ominously like that time you drank too much eggnog when you were 14. It’s all enough to make you want to kneel with your head on cold tiles and never move again. I didn’t even complete a full lap before I thanked the concerned booth staff for their time, staggered away and then politely found a toilet to vomit. Welcome to the future, there goes your banana nut breakfast muffin. But this thankfully isn’t my reaction to every virtual reality experience, and because we’re not all the same synths with the same wiring, it’s different for everyone. I’ve spent hours in the newly launched PlayStation VR headset without a single lurch, but speeding along in that rally car, bumping over rough terrain and screeching round corners was just too much. The disconnect between eyes and body beat my brain into furious submission. I’m not alone. GamesRadar hasn’t been able to officially review Driveclub VR because no one can wear the headset for longer than ten minutes without feeling dreadful. It’s not exactly a poster quote, but it’s the horrible truth. It turns out that driving games are exceptionally high on the vomit list but the question is why. While you’d think that a rollercoaster and VR would be a fast ride to vomitville, it’s actually the complete opposite. Because this is no simulator - Galactica used to be Alton Towers’ flying ride, Air - rider’s bodies are going through exactly the motions of what’s being sent into their eyes. Reveley and his co-workers at Figment actually tested the original prototype with wheelie chairs on a fixed figure-of-eight loop in their office, before scaling it up to an actual roller coaster. “It allowed us to prove that if you do want to move in VR and you don’t want to throw up everywhere you do need to be moving physically in the real world as well,” Reveley confirms. "It’s not the fact that VR makes you feel sick. It’s the fact that you are doing something fundamentally wrong with it." Then how on earth are we meant to cope with games? Games that have literally evolved to the point where characters can go anywhere and do anything. VR titles such as Batman Arkham VR use teleport mechanics for jumping between locations without a lurch in sight. While Rocksteady’s Dark Knight can look around each area, his feet are static unless you see an icon that means you can blink to that location. Bang. All of the movement, none of the sickness. Then there’s the games that want you to feel like you’re moving, make your heart race and put you in the moment. How can these exist and not make us want to hurl? Well, they do, but it’s not been easy. Sickness dictated every stage of this development process and that’s a new idea. Did Naughty Dog have to worry about you getting car sick during that chase in Uncharted 4? Of course not. It just layered on explosion after explosion. VR literally requires sacrificing gameplay for humans to handle it. This is new territory for developers, and studios like Rebellion are leading the charge. Battlezone’s cockpit doesn’t just look attractive and make you want to touch everything, it also plays a key role in making you feel less nauseous as you strafe. Bristow can’t be too specific about how much of an effect it has because the science is so new, but there’s definitely a more secure feeling inside the tank. “The fact that you’re enclosed and surrounded by a solid-feeling structure that you’re sitting in, as you are when you play the game - that all feels quite natural and it helps to sell the illusion,” he says. “And it also gives you a sort of sense of, I suppose I want to say protection. You’re not completely exposed to the environment, and that again just helps slightly with the comfort level in general. 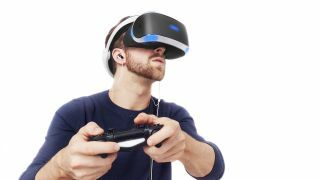 I don’t know how directly it has a bearing on motion sickness, but I feel that were we to remove the cockpit and have just a sort of purely virtual HUD, you would feel a return to that more extreme sense of motion which may trigger that nausea.” Developers have never had to worry about gamers feeling safe before. Previously, the mantra has been the more dangerous, the better, but not in VR. If virtual reality is to thrive, designers are going to have to make sure we don’t just yank off headsets immediately. My favourite addition is the fact that the radar gimbals around as you hurtle about. It’s another physical object in a virtual world, that behaves just as you expect it to. Like Jurassic Park with tanks, Rebellion has spared no anti-nausea expense. “Essentially, that’s inspired by a device that is used on board ships, like warships and so on,” Bristow explains. “If you’ve got a cabin or a meeting room on a warship, they realised that without any reference to the horizon, if the room’s tipping around, your other senses and your inner ear disagree with one another and that can trigger this issue.” This not only makes sense, but it’s analogous to the crosshair in FPS games, without which people can be prone to sickness and discomfort. It makes sense to immerse you further in a VR experience with bespoke frames of reference. Yet this is all entirely subjective. There’s no easy solution, no magic wand to fix each individual’s personal inner ear. This is a physical issue, and given that there’s no way to add a rollercoaster to each living room, it’s going to be a constant fight. Environmental changes and gimbals are only a few of the additions made to the game to make enjoyable, but one man’s Battlezone might be another’s vomit-spattered WRC 6. The important thing is that thankfully, this isn’t stopping developers from trying. Static experiences are fun - Batman is brilliant - but this can’t be all that virtual reality has to offer. Battlezone is proof that you can get your head in a moving tank without feeling like I did at E3. There are clearly ways to chip away at an experience to fool your body even further into believing it’s actually there. More research into the science of sick is needed as PlayStation VR moves stylishly into more homes, but we’re hopefully on the right track. Game design has to change for this to succeed or our smart new gadgets will be lost beneath a sea of sick, but it can be done. Battlezone is only the beginning. New levels of smart game design will lead us to a nausea-free future, and I can’t wait to see it.